Classified » Business & Office » Businesses for Sale » Buy Tikar Getah Flooring - Easy To Install & Low Maintenance!! BUY TIKAR GETAH FLOORING - EASY TO INSTALL & LOW MAINTENANCE!! Our Promo We save You save is the best promo to SAVE MORE & MORE MONEY!! Tikar Getah with a wood effect and hard to tear quality. If you love quick and easy installation or incredible beauty at affordable pricing, tikar getah flooring by ALAQSA CARPETS is the way to go. You’ll find no one provides low price with High-quality products as we provide to our customers. 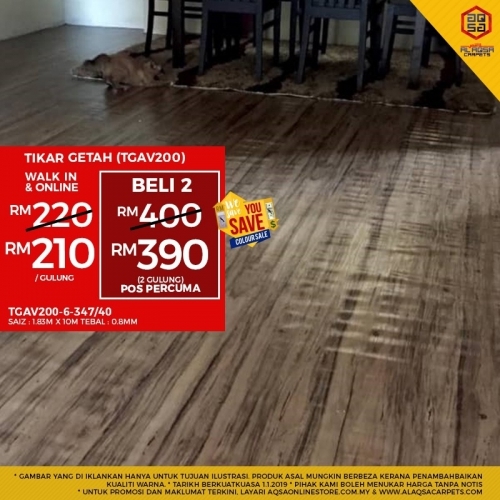 Tikar Getah Flooring At Just From RM210/Roll.